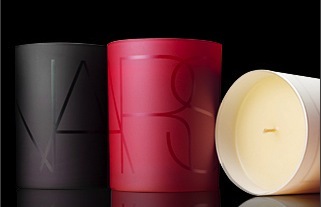 NARS Candles were created to elevate the senses and instill a peaceful ambiance. Each possesses a uniquely delicious aromatic scent formulated to enhance the mood, inspire the senses and provoke individual memories. Encased in white, black or red matte glass with the NARS logo, each paraffin-free candle is composed of rich essential oils, allowing for an optimum burn time of 70 hours. The one I have is "Oran"( white ), A complex blend of tuberose and white gardenia blossoms, heightened by floral touches of violette, jasmine and heliotrope. Sweet balsamic undertones of styrax and resin help compliment and balance vibrant citrus, bergamot and grapefruit notes along with luscious leafy greens. Acapulco( black ) - A delicious top note of rich, velvety chocolate is combined with a delicate blend of whipped cream accord and coffee bean for intensity and depth, while the dry down captures the senses with a distinctive base of cocoa powder and creamy vanilla. Bosphorus( white ) - Top notes of pure lilac blossoms and sweet essence of hyacinth are blended with middle notes of crushed green leaves, accents of currant, mandarin, and peony laced with raspberry and subtle aquatic notes. Jaipur( red ) - Top notes of a teasingly sweet blend of citrus are complimented with hints of pomegranate and balanced by rich, exotic floral notes of rose, jasmine and geranium. Full-bodied base notes of amber and vanilla add warmth to the tantalizing scent for an overall sweet and seductive sensory experience. Shangri-La( red ) - Fresh, clean top notes of bois de rose and mountain sage paired with warm, spicier notes of clove bud, nutmeg and basil leaves produced this enticingly spicy and exotic scent. The heart combines delicate notes of jasmine petals and black tea for a softly provocative touch.